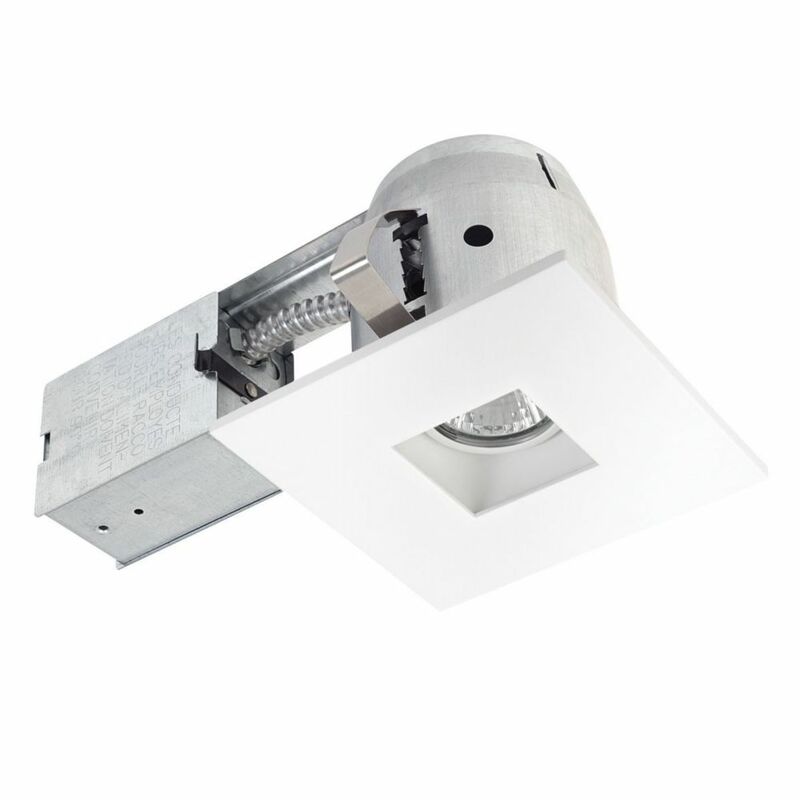 Globe Electric's 4" Regressed Swivel Spotlight Die Cast Recessed Lighting Kit with square trim and white finish is the perfect way to brighten up the interior of your home or commerce with style. Featuring patented PUSH-N-CLICK clips which are fully adjustable and extra wide to grip uneven surfaces and provide easy tool-free installation. A swivel light bulb gives you the ability to focus light on specific areas and can be directed for any desired look. An integrated cut-off switch ensures that the fixture will not overheat and can be used with or without an insulation box. Requires one 50W equivalent MR16 GU10 light bulb (sold separately). Dimmable with compatible bulb and dimmer switch. 90652 4 Inch Regressed Swivel Recessed Lighting Kit, Square Shape with Matte White Finish Globe Electric's 4" Regressed Swivel Spotlight Die Cast Recessed Lighting Kit with square trim and white finish is the perfect way to brighten up the interior of your home or commerce with style. Featuring patented PUSH-N-CLICK clips which are fully adjustable and extra wide to grip uneven surfaces and provide easy tool-free installation. A swivel light bulb gives you the ability to focus light on specific areas and can be directed for any desired look. An integrated cut-off switch ensures that the fixture will not overheat and can be used with or without an insulation box. Requires one 50W equivalent MR16 GU10 light bulb (sold separately). Dimmable with compatible bulb and dimmer switch. 90652 4 Inch Regressed Swivel Recessed Lighting Kit, Square Shape with Matte White Finish is rated 4.7 out of 5 by 3. Rated 4 out of 5 by Tundradave from Product was very good and met expectations. Dropped one star as this along with the 10pk ordered,... Product was very good and met expectations. Dropped one star as this along with the 10pk ordered, the swivel was not perfectly aligned with the square cover, so each had to be manually adjusted prior to installation. Ordered LED bulbs to go with them and they look great. Rated 5 out of 5 by Flipper from Modern, clean lines. Very easy to install. Using LED lamps, IC is no problem as the LED bulb pr... Modern, clean lines. Very easy to install. Using LED lamps, IC is no problem as the LED bulb produces little heat. Dimming works great, make sure you purchase the correct dimmer switch.